Happy Wednesday, ya'll. According to the United States Postal Service, my first Julep box is currently in transit to my house. It's the Boho Glam starter box, and neither of the colors like, blew me away online but I liked them more than the other types, so we'll go with it. I'm on the waiting list for Ipsy, too. I have a new weakness for subscription boxes. 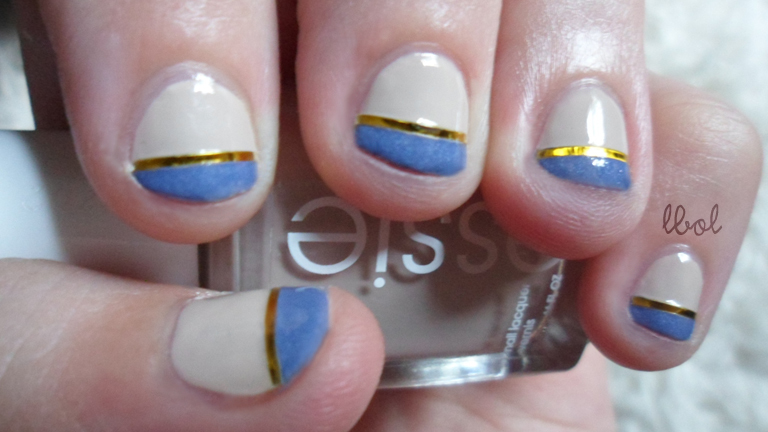 I picked up some Fing'rs striping tape the other day and did a super simple manicure using Essie Sand Tropez and Smooth Sailing. I liked it for about eight minutes before it made me think about those pictures you see hanging up in hotels or whatever from the 90s. The flower ones, where the colors are all muted because of them being old and awful. Shudder. I have a real issue with the 90s. That horrible super-yellow cheap-looking gold with pastel turquoise and periwinkle and, like, peach. Barf city. But anyway, now that I'm looking at the picture I don't hate it as much as I thought I did. Please excuse my toe-looking ring finger. I have to learn not to press down using that finger, I guess. Plus it's way shinier than the other ones. I should probably cut it off for future photos so you don't have to be subjected to its awkwardness. But, yeah. Kind of wishing I had given it a chance. Oh well. I love Smooth Sailing by the way. I don't often proclaim my love for periwinkle (after all, periwinkle?!) but this color is so lovely with its silver NO WAIT subtle turquoise and lavender shimmer. 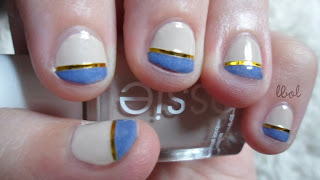 I shall explore this striping tape deal more in the near future, I think. Details, plz. So the gold is striping tape? Or you used tape and polish for this technique? I saw a dope pair of scissors with a cool design that I should have bought but didn't that would work with scotch tape, I think? Yeah, I just painted the bottom part Sand Tropez and the top part Smooth Sailing and used gold striping tape to cover up the jagged mess where they met. I have never successfully used scotch tape for a design yet, but that's because I didn't know about the beauty of fast dry top coat. Duuude those designs with the fancy scissors always look amazing.